In past blogs I wrote about the “Prison Paradox“–the idea that incarceration in America has gotten so out of control that it may actually increase crime by creating a poverty trap and perpetuating prison culture. People of all races use drugs at roughly same rate, but minorities are disproportionately imprisoned for drug related offenses. Meanwhile, “White America” is currently experiencing the well documented “opioid epidemic”. Drug abuse, treatment, and incarceration should be issues that transcend racial barriers. On the micro level, drug related criminal justice reform that prioritizes treatment over prison can keep families together. It can keep people in the labor force and in productive society, instead of exposing them to hardened criminals in prison (potentially turning minor offenders into career criminals). Even when prison doesn’t “harden” someone, difficulties finding employment can lead to recidivism (re-incarceration) among ex-cons. On the macro level it saves money on incarceration and welfare programs. 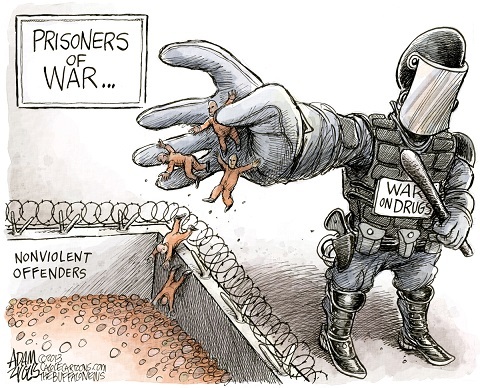 As the “War on Drugs” is no longer achieving its goal–reducing crime–what these funds are spent on is largely irrelevant. Liberals would probably like to see more social programs and public goods. Conservatives would probably like to see more defense spending or a reduction in government debt. This debate can be had once the savings are realized and the socially damaging policies are reversed. Attorney General Session’s directive claims to give judges more freedom, but it does the opposite. All Holder’s directive did was allow judges to consider the facts of the case before delivering a sentence. It did not prevent them from doling out severe sentences when the situation dictated it. Session’s directive takes this freedom away from judges. There is no significant public support for this stricter rule. 14 States Attorneys General have written a letter asking Sessions to rescind the rule. Rand Paul has reintroduced bipartisan legislation to ease mandatory minimum sentences, which would override the Session ruling. Unfortunately, based on the current political climate, I wouldn’t count on such legislation getting passed anytime soon. Categories: Blog Posts, Conflict Watch, Economic Outlook | Tags: criminal justice reform, Poverty trap, prison paradox, recidivism | Permalink.